Thailand is renowned for having some of the world’s best prostitutes. It also has some of the scariest. My first order of business upon arriving in Bangkok was an early morning trek to the Damnernsaduak Floating Market, a 90 minute drive south of town in light traffic, and one of the most fascinating places I’ve ever been. The Damnernsaduak Floating Market is a series of canals lined by rickety wooden stalls selling all manner of goods, from tacky tourist items to local art and sculptures. You can purchase exotic spices and oils, native clothing, a vast array of fresh fruits, and even play with snakes. When you arrive at Damnernsaduak you hire one of the long-tailed wooden boats to guide you through the markets. A 2-hour tour is around 300 Bhat (about $9), and the boatman will just float along past shops til one peaks your interest and you ask him to pull up alongside. 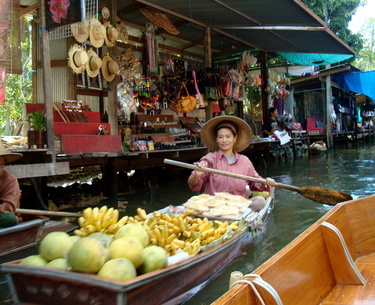 There are also numerous merchants in other boats selling fresh fruits, meats, or cool drinks. They’ll pull up beside your boat to pour you hot tea, show off their fruits, or describe (always in a language I don’t understand) what their meat on the stick is and why you must buy it. In the middle of the market is a non-descript shack that at first glance appears to be selling nothing. There are a couple of guys lounging in chairs enjoying a smoke. Upon closer inspection you discover that the men are draped in huge snakes, and are all too eager to show them off to interested tourists. I can’t resist bad decisions like this, so of course I stopped. The snakes are huge, and there are many. The men will keep draping them over you until you tell them to stop. At one point I had three large pythons writhing around my body. I don’t particularly like snakes, but this was very cool. I noticed a huge pen in the back of the hut holding a snake that appeared to be as thick as my torso. I’d never seen such an enormous constrictor, and asked if I could hold it. The men chuckled and said sure, but that it might eat me. I decided to pass on that one. Once done shopping my first order of business was treating myself to a traditional Thai massage. In past visits to Bangkok I’ve gone to Health Land, an absolutely first-rate spa. This place is entirely above-the-board – no extracurricular activities here. But Health Land had no last-minute appointments available, so I wandered out of my hotel sure I’d find something close by. Almost immediately I chanced upon a charming-looking place offering “clean” massages – a definite plus – and ducked inside. The pleasant women at the desk did her best to sell me on various things like a body scrub, aroma therapy session, etc, but I was quite content with just the massage. Ok, I did splurge on the additional 15 minute foot-massage. I think I would have splurged on an additional 5 hour foot massage, but it wasn’t on the menu. I stared at her, disbelieving. She had asked with about as much interest as my cat shows in the evening news. It turned my stomach. “Er, no, I’m good, thanks”, I managed to stammer. This was apparently not the answer she expected. She cocked her head, reached under the towel, and asked again. I lurched up, clasping the towel, and assured her I didn’t. “What wrong wit you?” she angrily demanded. I was sweating profusely. It occurred to me that I was terrified of this tiny Thai girl. I suddenly hit upon a solution. “How much is the happy ending?” I asked. This was not the first time I’d been so accused. I know I lose man-points for this, but I was desperately relieved. I still can’t quite explain my reaction, and I realize I’m either the world’s biggest coward, terrified of a 90-pound girl, or the world’s worst consumer, but I felt like I’d just achieved a stay of execution. I passed her the money as she padded out of the room. I belatedly asked for a receipt, I guess out of habit. I got only a derisive snort in response. Probably just as well – I’m not sure how I could have included a “happy-ending avoidance fee” on my expense report anyway.